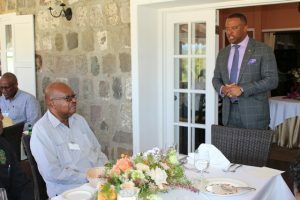 Nevis was graced with a visit by a number of heads of state from the Caribbean on April 09, 2018, ahead of the official start of the 16th Conference of Governors-General and Presidents of the Caribbean Region in St. Kitts at the St. Kitts Marriott Resort from April 9 to 12. (Charlestown, Nevis–Monday, November 1, 2010) Premier of Nevis, the Hon. 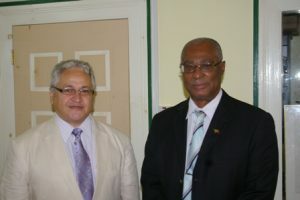 Joseph Parry welcomed Brazilian Ambassador to the Federation of St. Kitts and Nevis, His Excellency, Mr. Miguel Magalhues, as he paid a courtesy visit to the Premier’s Bath Hotel office on Thursday. (Charlestown,Nevis–Wednesday, September 29, 2010) Premier of Nevis, Hon. Joseph Parry told the Department of Information on Wednesday, that Nevisians can soon look forward to the re opening of the flagship of Nevis Tourism, the Four Seasons Resort. 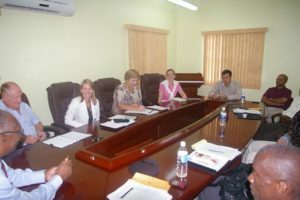 (Charlestown,Nevis–Friday, September 10th, 2010) — The Nevis Island Administration under the Premier of Nevis, Hon. Joseph Parry continues to encourage empowerment of local business with financial assistance and other supportive measures. 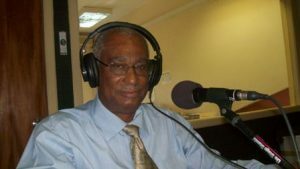 On the Premiers’ weekly call in radio programme,” In Touch with the Premier,” on Tuesday, the Premier said there was a need to have a level playing field with respect to investment on Nevis. Premier of Nevis Hon. Joseph Parry welcomes the West Indies Power Nevis Ltd. team to his Bath Hotel Office. (L-R) Premier Parry, Chief Executive Officer Mr. Kerry McDonald (partly hidden) General Manager Mr. Rawlinson Isaac and Chief Financial Officer Mr. Demetrius Pocanus. CHARLESTOWN NEVIS (September 07, 2010) — Premier of Nevis Hon. 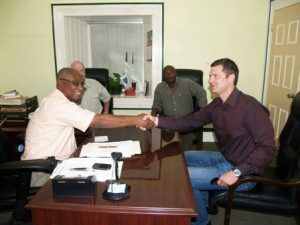 Joseph Parry, received an update on the advances made by geothermal developers West Indies Power Nevis Ltd. in their pursuit to provide geothermal energy to Nevis. He received the information when the company’s top officials visited him at his Bath Hotel Office on Friday.